TAIPEI, Taiwan, June 27, 2011 – Hybrid chip architecture is a huge revolution. Say hello to the new-gen of AMD APU. Today, ASRock is confident to release their A75 Motherboard Stunners featuring the perfect integrated graphics performance to mainstream DIY market. Based on the latest AMD A75 chipset and FM1 socket, the ASRock A75 Motherboard Series support AMD’s new Llano APUs. Coupled with the outstanding ASRock A75 mainboard and the exciting APU processor, ASRock is ready to rock the world with the best graphics performance ever seen on an integrated processor. Featuring AMD A75 Hudson-D3 chipset, ASRock A75 boards are wonderfully suited to the latest 32 nanometer AMD APUs and can natively support USB 3.0 and SATA3 technologies. The APU is the architecture to feature a GPU on the same silicon die as the CPU and is a perfect combination of DirexX11 technology and high performance graphics, offering powerful visual experiences similar to a discrete graphics configuration. 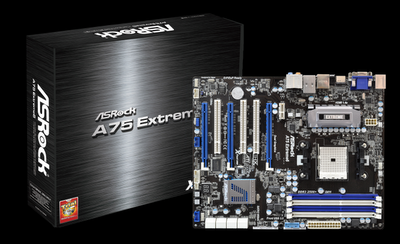 A75 Extreme6, the top-of-the-line board of the innovative A75 APU motherboards. It is super powerful and brings visual enhancements in the field of integrated graphics. The APU processor integrates AMD Radeon HD 65XX/64XX and DX11 graphics technology, delivering the optimized visual enjoyment to users. AMD Radeon™ Dual Graphics Technology combines the powers of APU and discrete GPU, providing significant performance boost and immersive gaming experience. Steady Video™ leverages the processing power of the GPU in order to remove shakiness from the home/online video. Powered by V8 + 2 CPU phase design, the ASRock A75 Extreme6 improves power solution and delivers Vcore voltage to the CPU more efficiently and smoothly. The board is also marked for its versatile. PC DIYers will definitely appreciate the onboard power/reset and clear CMOS switch buttons as well as the integrated display outputs (D-Sub, DVI-D and HDMI). Moreover, the board gives decent multi-GPU options as well - 3 PCI Express 2.0 x16 slots cater for Quad CrossFireX, 3-Way CrossFireX and CrossFireX settings. In addition to the flagship board A75 Extreme6, the much-anticipated A75 platform comes with several models – A75 Pro4 / A75 Pro4-M / A75M / A75M-HVS. All of the excellent A75 Motherboard Stunners come in a feature-rich package too is likewise impressive. The full series supports a hot of unique features such as tweak-friendly graphical UEFI, XFast USB, On/Off Play and Cyberlink MediaEspresso 6.5 Trial software. The most important feature of the bundled package is obviously the THX TruStudio™. It has been applied on all ASRock A75 Motherboard Series, bringing unparalleled audio experience. With the industry leading surround sound technology, you’ll see a different A75 mainboard here. Focus tightly to high performance and quality, ASRock has thrown everything essential to its A75 Motherboard Series. 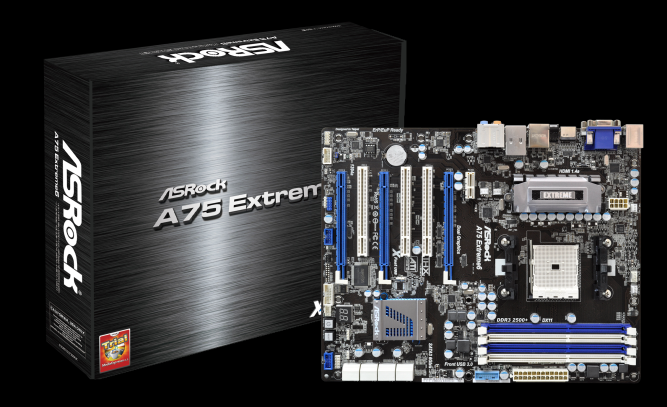 Picking an ideal board is so easy only at ASRock A75 Motherboard Stunners!